It’s Monday and in my home, that means blog day. Monday blog is a way to get my week off to a swing. I was hoping for good, good, good news all the way but it’s sort of good, good, oh hum. Not quite the good, the bad and the ugly, but a close shave! Let’s kick start this Monday blog with good because that is my favourite place to start. My new Spring Inspirations ebook is out. 500 fabulous photos offer tons of inspiration for artists and textiles. Looking for a fab flower to quilt? You’ve got it. How about a coastal scene? No problem. 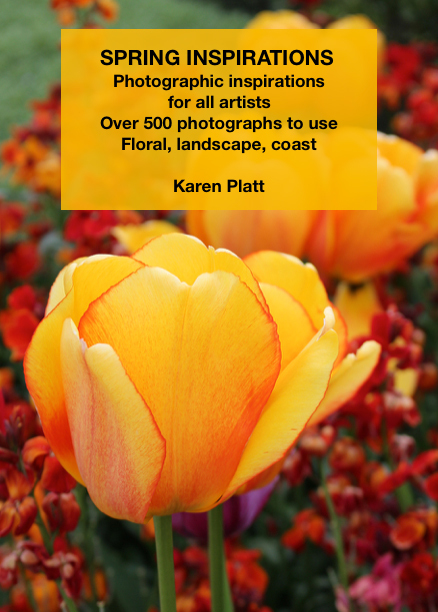 You can use the images to design your textiles or quilts, to paint, inspire your pottery or whatever. Sorted. The ebook is on the website now, and at just 7.99 makes a superb gift too. I think you are going to love the cover. Now we come to ho hum. When I joked that version 3 of the competition quilt was a goer and looking great, but that finishing 3 weeks early meant that I would have time to do version 4 if not 5, I had no idea that by Sunday I would truly be on version 4. There was much cursing and hating of quilts. Then I put my head down and got on with it. What else to do? 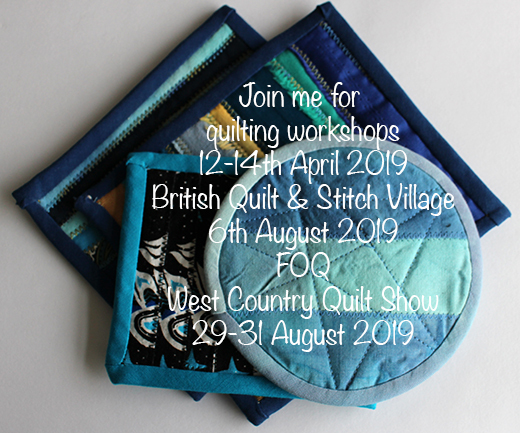 The main problem is that when I entered this quilt competition at the British Stitch and Quilt Village, I had no idea what I was going to quilt, but had to come up with a category and a title. Not only that a price too. Ever since I have cursed myself. I limited myself to something I thought of on the spur of the moment. I am not saying anything about version 4, I have learned my lesson. Version 1 was slightly too large. Version 2 at least twice the work I had priced the quilt at. Version 3 an utter mess – what was I doing? Not a word about version 4. If I have to go to version 5, I am giving up not just on quilting but on life. I am also doing a colour workshop at this show, so sign up now, I have heard tickets are going fast. It cannot be all that bad. The sun is shining. I can still quilt. Version 1 is now on sale on the website. I have a lovely version 2 hand-stitching project going on. I am dying to start the FOQ quilt, but before I name it and price it, I am going to work out exactly what I am doing and how.